Home online deals LED Christmas Lights Phone Charger! LED Christmas Lights Phone Charger!! What a fun gift to give someone before Christmas! I’d love to keep this in my car & I’m sure my girls in college would love this for their dorm & apartment! 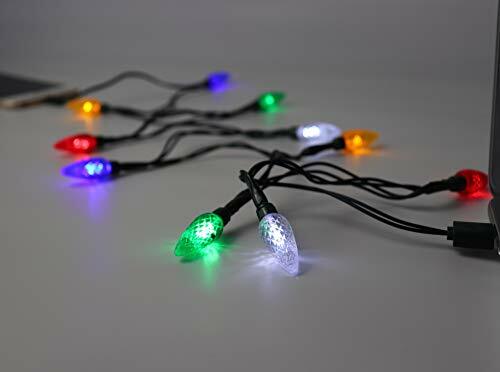 Hurry and get the LED Christmas Lights,USB and Bulb Charger for just $7.49 from Kohls.com when you use promo code HOLIDAY25 at checkout! These will probably sell-out quickly! Looks like this is only for Apple devices. Shipping for this from Kohl’s is free with a $25 purchase! If Kohl’s is out of stock, check Amazon (currently only 3rd party sellers or backordered) or Target.com (currently sold-out online but you can check the availability at your local stores)! The USB cable comes with 10 LED multicolored festive lights that will illuminate when in use. Charge your electronic device with holiday spirit. Previous articleAirborne Coupons & New Deal at Big Lots – No Coupons Needed!